Driving Away with This Cadillac Escalade ESV Luxury Doesn't Mean Compromising On Quality 1 Owner! Locally Owned! No Accidents! Clean Carfax! Under Factory Warranty! Import Auto Sales graded the Overall Condition of this vehicle as Excellent. Non-smoker vehicle!Experience a Fully-Loaded Cadillac Escalade ESV Luxury Heads Up Display, Bluetooth, KONA BROWN WITH JET BLACK ACCENTS, FULL LEATHER SEATS with mini perforated inserts, ENTERTAINMENT SYSTEM, REAR SEAT includes two 9" screen DVD player (Blu-Ray capable) with remote control, four 2-channel wireless digital headphones, auxiliary audio/video jacks on rear of center console, sound compression, CD-R and CR-R/W capability, LED backlighting display, MP3 capable, HDMI/HML input, 2nd USB port with 2.1 amp charging and Wi-Fi capability via Digital Living Network Alliance (DLNA), ENGINE, 6.2L V8 WITH ACTIVE FUEL MANAGEMENT Spark Ignition Direct Injection (SIDI) and Variable Valve Timing (VVT), includes aluminum block construction (420 hp [313.2 kW] @ 5600 rpm, 460 lb-ft of torque [621 N-m] @ 4100 rpm) (STD), DVD SCREEN, THIRD ROW, DARK GRANITE METALLIC, 22" 6-SPOKE HIGH-GLOSS BLACK WHEELS. FRONT LICENSE PLATE BRACKET, CADILLAC CUE INFORMATION AND MEDIA CONTROL SYSTEM WITH EMBEDDED NAVIGATION 8" diagonal color information display featuring touch response, haptic feedback, gesture recognition, Natural Voice Recognition, Phone Integration for Apple CarPlay and Android Auto capability for compatible phone, Collection and Teen Driver. Five USB ports, including one in the articulating storage door/bin and auxiliary audio port (STD), Wireless Charging located on the top of the center console (Requires separately purchased adapter. ), Wipers, front intermittent, RainSense, Wiper, rear intermittent with washer, Windshield, solar absorbing, Windows, power, with driver and front passenger Express-Up/Down and rear passengers Express-Down, Windows, power all doors, comfort open (auto express down via key fob), Universal Home Remote includes garage door opener, 3-channel programmable, Transfer case, active, 2-speed with Neutral for dinghy/flat towing, Trailering equipment, heavy-duty includes trailering hitch platform, 7-wire harness with independent fused trailering circuits and 7-way sealed connector, Tow/haul mode selector, button located at end of shift lever.SECOND ROW BUCKET, POWER CONFIGURABLE SEATS, FRONT BUCKET with leather seating surfaces, driver and front passenger, 12-way power seat adjusters including 4-way power lumbar control, independently heated driver and front passenger seat cushions and seatbacks (three settings) and 2-position driver memory, REAR AXLE, 3.23 RATIO, LUXURY PREFERRED EQUIPMENT GROUP Includes POLISHED EXHAUST TIP, MOLDED SPLASH GUARDS, INTERIOR PROTECTION PACKAGE includes all-weather floor mats, all-weather cargo mat, BLACK ROOF RACK RAILS. 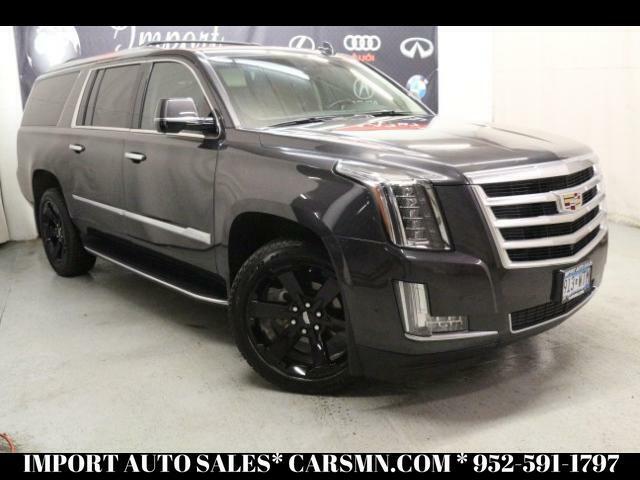 This Cadillac Escalade ESV has a strong Gas V8 6.2L/376 engine powering this Automatic transmission.Visit Us Today For a must-own Cadillac Escalade ESV come see us at Import Auto Sales, 730 Florida Ave S Golden Valley, MN 55426. Just minutes away!Inquire Online or Call Us at 952-591-1797 Great Financing is Available and Trades are Welcome! !